Patch PES 2017 Terbaru dari VirtuaRED.com V5.0 AIO – Berikut penampakan dan fitur patch PES 2017 terbaru dari VirtuaRED.com V5 AIO. • Database updated with all 17/18 winter transfers on all European leagues + Superliga Quilmes Clásica. • Squads have been reviewed. Strategies, team shooters, and all team preferences are up to date. • More than 3000 new players created. Removed retired players from their previous teams. • Player stats have been updated to 17/18 season. • Updated the real group standings for UEFA Champions League 17/18 and UEFA Europa League 17/18. • Real 17/18 UEFA Super Cup. In addition, real Spanish, French, German, Portuguese, Dutch local Super Cup 17/18 and more. • Updated with 17/18 promoted and relegated teams: Ligue 1 Conforama, Domino’s League 2, Serie A TIM, Serie B ConTe.it, Eredivisie, LaLiga Santander, Liga 1|2|3, Liga NOS, Bundesliga, Superliga Quilmes Clásica, Campeonato Nacional ScotiaBank and more. • Kits 17/18 for most of the teams in the game. • Added 781 new faces and hairs. Total: 5297. • Added more than 8200 player mini faces. • Stadium supporters adapted to be like PES 2018. • Updated team and competition logos to 17/18 season. • New FIFA font replacing the Konami’s original. • Original PES 2018 intros replacing the PES 2017 ones. • Added new 17/18 promoted teams: Bolton Wanderers FC, Millwall FC, Sheffield United FC, LB Chateauroux, Paris FC, US Quevilly-Rouen, Metrople, US Cremonese, Foggia Calcio, Parma Calcio 1913, Venezia FC, NAC Breda, VVV-Venlo, Albacete, FC Barcelona B, Cultural Leonesa, Lorca FC, CD Aves, Portimonense SC, Hannover 96, VFB Stuttgart, Argentinos Juniors, Chacarita Juniors, CDP Curico Unido. • Added other new teams: KF Skënderbeu Korçë, SV Zulte Waregem, FC Bate Borisov, HNK Rijeka, Apollon Limasol, SK Slavia Praha, FC Fastav Zlín, AEK Athens FC, FK Vardar, FC Sheriff, Rosenborg BK, FC Lokomotiv Moskwa, FC Spartak Moskwa, NK Maribor, FK Crvena Zvezda, FK Partizan, FC Lugano, Östersunds FK, İstanbul Başakşehir FK. • Added new legend teams: Club Atlético de Madrid 95-95, FC Barcelona 91-92, Real Madrid CF 58-59, Real Madrid CF 86-87, Real Madrid CF 03-04, Liverpool FC 81-82, Manchester United FC 98-99, Nottingham Forest FC 79-80, FC Internazionale Milano 64-65, Juventus FC 84-85, AC Milan 89-90, SSC Napoli 87-88, BV Borussia 09 Dortmund 96-97, FC Bayern München 73-74, AFC Ajax 72-73, SL Benfica 61-62, FK Crvena Zvezda 90-91, Santos FC 62-63. 1- Download the 31 parts (in case of Direct Download) or the 5 parts (in case of Torrent). 2- Unzip the parts, preferably with WinRAR. 3- Execute VirtuaRED.com Patch 2017 v5.exe installer. Be sure that you select the proper PES 2017 download folder. 4- (OPTIONAL) Download the Extras and execute the installer. Be sure that you select the proper PES 2017 download folder. – Previous versions are not needed to install the v5.0 patch. It’s AIO (All In One). 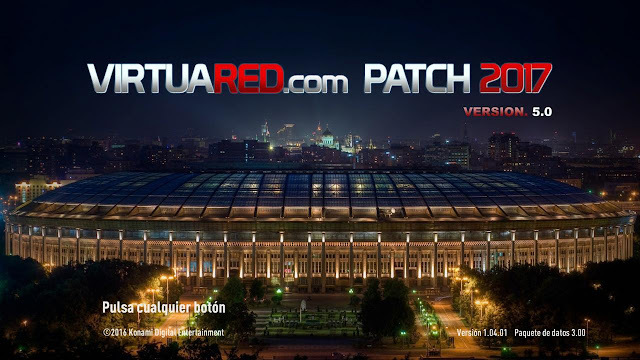 – We recommend to install this patch over an empty and cleaned Pro Evolution Soccer 2017 game. – It is important to disable the live updates, if not, the EDIT file would be overwritten. – In order to avoid problems unzipping, don’t use programs like MegaDownloader. Use the standard way to download. If you still have problems with some parts, try to download them using Mozilla/Internet Explorer. – If you have problems being redirected from ouo.io to Google Drive mirror, check this tutorial. * If you detect any link down, let us know contacting by email: info@virtuared.com. * You can share this patch, but please respect the original links. * All v5.0 credits have been updated on main post’s CREDITS section.